In the administrative state, agencies use expertise to address a specialized category of problems. While specialization and expertise have been highly touted, there is much to be gained by considering how seemingly different categories of problems can be addressed with interdisciplinary approaches. 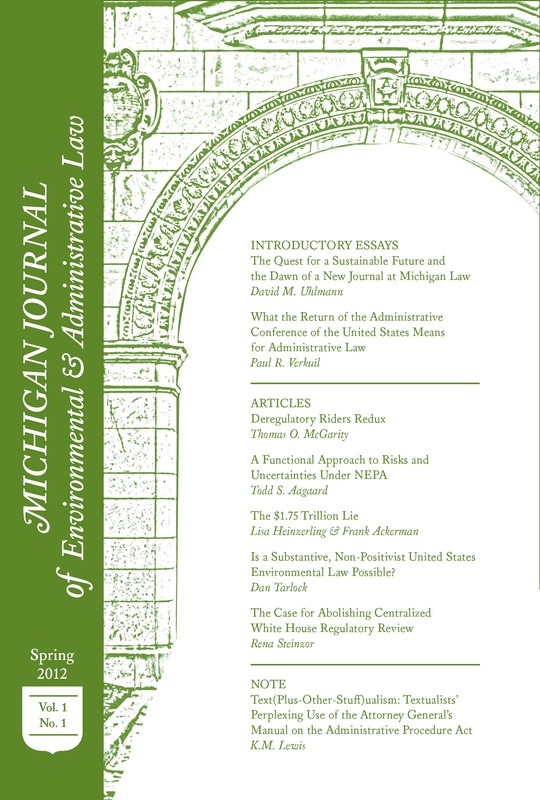 In this spirit and drawing on insight and dilemmas from environmental regulation and criminal justice, this paper proposes that prisons should be used as testing grounds for new environmental regulations. This new policy has the potential to effectively address issues across specialties— possibly improving effectiveness in rehabilitating prisoners, increasing chances of successful reentry of inmates into society, lowering costs of running the prison system, and facilitating new innovations in effective environmental regulation. US prisons currently boast mixed records in terms of environmental compliance and sustainability. Some US prisons have made a large push to go green—improving energy efficiency in current facilities and planning for new sustainable facilities. [ii] This effort to make prison facilities more environmentally friendly is seen as a budget savvy strategy and a way to accommodate the needs of inmates. [iii] At the other end of the spectrum, some prisons have simply failed to comply with basic environmental regulations. [iv] By involving the US prison system in the testing of new environmental regulation, prisons could benefit from increased involvement in environmental compliance and increased scrutiny. As a result, prisons may be encouraged to comply with current regulations while also being able to contribute to environmental progress. While this policy would be an unusual, it is nonetheless consistent with the idea that the federal government benefits from “smaller laboratories of democracy.”[v] Traditionally, the conception of federalism pertained only to states. But considering that the US prison population hosts about 2.2 million inmates[vi], prisons might be the next “smaller laboratory” whose innovation could benefit the federal system at large. Testing new environmental regulations in prisons may be an unlikely way to alleviate the burdens taxing the US penal system. At a basic level, incorporating environmentally friendly practices would simply lower the daily costs of running prison facilities. [x] Perhaps more importantly, by testing environmental regulations in prisons, the penal system might benefit from a new means to rehabilitate inmates. Testing environmental regulations inside prisons could give inmates an opportunity to work together toward a common goal. This effort would likely entail the learning of new skills and a greater sense of pride and usefulness. Additionally, this sort of communal effort could give prison sentences more meaning. Inmates would have an opportunity to in a sense repay their debt to society by participating in an effort that could advance environmental standards and human health for society at large. The learning of new skills, the participation in collective initiatives, and the opportunity to give back to the community, all offer new opportunities for rehabilitation. Ideally, this rehabilitation would be accompanied by increased success when inmates reenter their communities. Consequentially, successful reentry would decrease recidivism rates. Finally, lower recidivism might decrease the overall costs of the criminal justice system. Ultimately, the testing of new environmental regulations in prisons is an interdisciplinary approach that could address very different categories of problems. It could help environmental regulators make informed decisions when adopting new policies and may provide new insight on how to effectively implement new regulations. Correctional systems could enjoy lower costs while inmates may benefit from new opportunities for rehabilitation. In this way, testing environmental regulations in prisons offers a classic “two birds with one stone” policy solution to chronic problems faced by the penal system and environmental regulators. -Jessica Shaffer is a General Member on MJEAL. She can be reached at shjess@umich.edu. [i] Exactly which new environmental regulation should be tested is outside the scope of this paper. But some brief ideas include initiatives in energy efficiency, waste management, and food sourcing and disposal (like the EPA’s new initiative, the Food Recovery Challenge. [ii] Beth Schwartzapfel, Greening the Prison-Industrial Complex. N.Y. Times (March 3, 2009), http://green.blogs.nytimes.com/2009/03/03/greening-the-prison-industrial-complex/. [iv] Environmental Protection Agency: Information for Prisons and Correctional Institutions, http://www.epa.gov/region03/compliance_assistance/prisons.htm. [v] New State Ice Co. v. Liebmann, 285 U.S. 262 (1932). [vi] Ezra Klein and Evan Soltas. Wonkbook: 11 facts about America’s prison population, Washington Post Blog (Aug. 13, 2013, 8:07 AM), http://www.washingtonpost.com/blogs/wonkblog/wp/2013/08/13/wonkbook-11-facts-about-americas-prison-population/. [vii] National Association of State Budget Officers, 2009 State Expenditure Report, Washington, DC: National Association of State Budget Officers, December 2010. [viii] Recidivism, Bureau of Justice Statistics, http://www.bjs.gov/index.cfm?ty=tp&tid=17 (last visited Mar. 16, 2014). [ix] John Dewar Gleissner, Esq. Recidivism—Its Causes and Cure. CorrectionSource (April 30, 2012), http://www.corrections.com/news/article/30720-recidivism-its-causes-and-cure. [x] Beth Schwartzapfel, Greening the Prison-Industrial Complex. N.Y. Times (March 3, 2009), http://green.blogs.nytimes.com/2009/03/03/greening-the-prison-industrial-complex/. [xi] Prisoners are still incapacitated, served just deserts, and rehabilitated. New offenders are still deterred. [xiii] Consider the Montana Correctional Facility, which has created a prison/mushroom farm, where prisoners gain new labor skills, while giving back to the community. See Heather Rowlison, “Sin No More:” Recidivism and Non-Traditional Punishments in Wyoming, 58 Baylor L. Rev. 289 (2006). Next The EPA’s Regulatory Power: Set to Shrink or Grow?